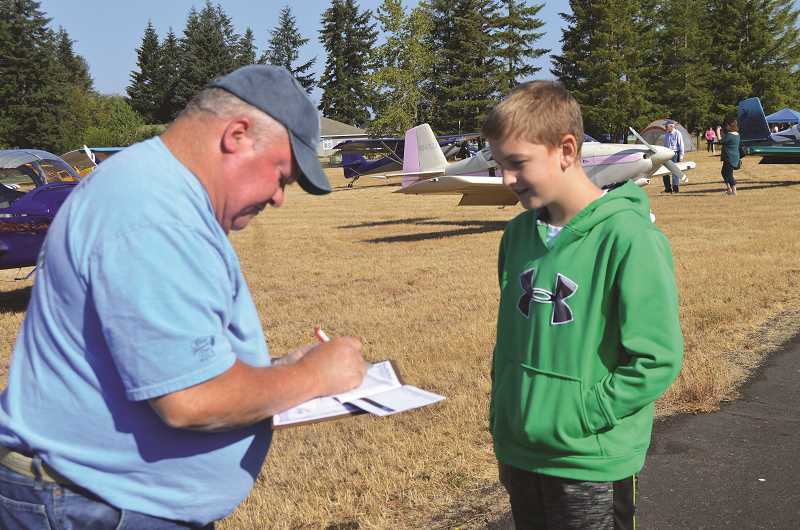 The Experimental Aircraft Association (EAA) Young Eagles program offered free flights to 30 youth, ages 8-17, at Estacada's Valley View Airport on Saturday, Aug. 19. The term experimental means the planes are built from a kit, some are built by the pilots and take 900-2000 hours to assemble and some are factory built. 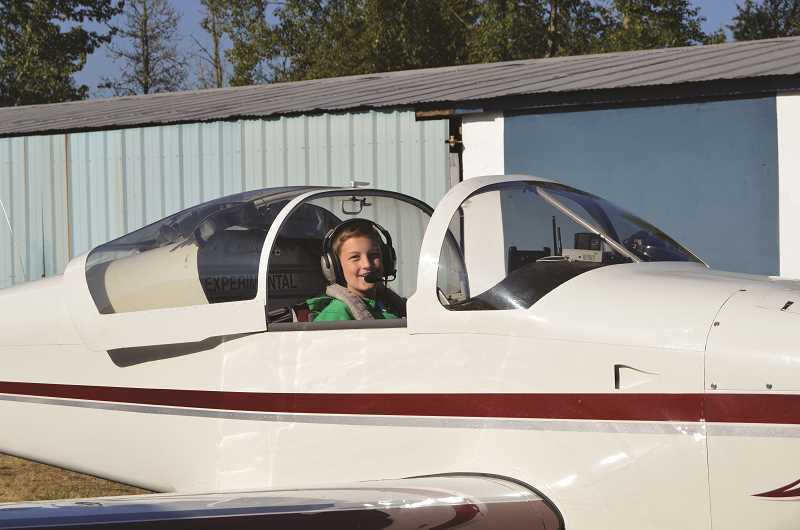 The flights for the Young Eagles were made possible by local pilots who volunteer to give kids the opportunity to experience their first flight in a general aviation aircraft. Wyatt Holliday, who is about to start his first day at Colton Middle School as a sixth grader, had another first when he accepted the chance to fly with local EAA pilot, Bob Lewis, at the Young Eagles event. "It seemed like a fun thing to do," Holliday said, "an opportunity of a lifetime, so I said yes." So, on that beautiful appointed morning, Holliday got to meet Bob Lewis, a retired Air Force and National Guard pilot, who also flew for Northwest and Delta Airlines. Before getting into the aircraft, Lewis told the young man what to expect during the flight and the two walked around the plane to do the pre-flight inspection while Lewis explained what and why they were doing each aspect of the safety review. Then it was time to enter the cockpit and prepare for takeoff. Wyatt had the biggest smile on his face as the plane taxied out to hit the runway and go sky bound. Twenty minutes later when the plane landed, Lewis said, "He did great." "We flew over our house," Holliday said. He had the chance to take the controls as the plane flew over Colton's schools and up and over the North Fork Reservoir outside of Estacada. "It is one of the best things I have ever done," Holliday said. "It is amazing how far up you are but yet how close you are to what you know. It is pretty fun to fly and the landing was pretty cool." Lewis said the Young Eagles Experience is a really good program to expose kids to something different and maybe they will see aviation as a future hobby or career.